New York: Trigger-happy investors dumped US stocks on Thursday, scared by the market’s sudden fall through a key technical level brought on by more worries about Europe’s debt troubles. Investors have been increasingly focused on Europe, and markets were cautious early as bond yields in Spain and Italy rose to levels viewed as unsustainable. Some market sources cited squabbling between Democrats and Republicans on the congressional “supercommitee" formed to find ways to cut the US debt. But Peter Costa, president at Empire Executions said from the NYSE floor that none of the catalysts market participants were pointing to as triggering the sell-off was new “news." “It doesn’t take much if you’re teetering on a support or resistance level," he said. “When you’re on the precipice of either one, and something comes out, this computer-generated trading pops into effect and that usually accelerates any reaction you’re seeing." The fall around midday was swift and volume picked up once the 1,225 level was breached. About 2.83 million S&P E-Mini futures contracts traded on Thursday, with nearly 250,000 changing hands in an unusually busy 15-minute period when the market fell more than 1%. The S&P struggled to break above 1,225 in August and September before piercing it on the way to a two-month high in late October. Computer-generated trading usually uses previous clusters of buying and selling as triggers. The Dow Jones industrial average fell 134.71 points, or 1.13%, to 11,770.88. The S&P 500 lost 20.73 points, or 1.68%, to 1,216.18. 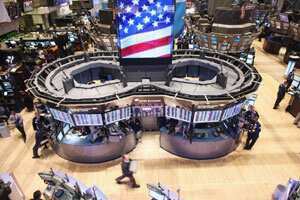 The Nasdaq Composite dropped 51.62 points, or 1.96%, to 2,587.99. About 8.6 billion shares traded on the New York Stock Exchange, NYSE Amex and Nasdaq, above the current daily volume average of just above 8 billion shares. Declining stocks outnumbered advancing ones on the NYSE by a ratio of more than 4 to 1, while on the Nasdaq, more than five stocks fell for every two that rose. Declines in materials and energy shares accelerated with losses of more than 3% in crude futures and copper prices. The S&P energy index fell 2.1% and the S&P materials index declined 2.9%. Tech shares also dragged the market lower, with the S&P technology index down 2.2%. The 10 major S&P 500 sectors closed in the red for the day. The broad sell-off repeated the pattern seen lately in which stocks are treated as an asset class, with little differentiation between winners and losers. “Pretty much everything’s for sale. There’s a move toward cash, and (US) bond prices are (up)," said Tom Schrader, managing director of US equity trading at Stifel Nicolaus Capital Markets in Baltimore. Earlier, Spanish bond yields hit their highest level since 1997 at a 10-year auction, while a French bond auction also drew high yields. The 7% mark for bond yields that both Italian and Spanish benchmarks are close to is viewed as a line in the sand. Both Greece and Portugal were forced to seek bailouts after yields hit similar levels. Investors have worried that the debt problems in the euro zone could tip the global economy into another recession, even as US data has suggested the economy is picking up. New US claims for jobless benefits hit a seven-month low last week and permits for future home construction rebounded strongly in October, the latest data to suggest the economy was gaining traction. While traders on the New York Stock Exchange floor gloomily watched prices fall, hundreds of Occupy Wall Street protesters marched, vowing to interfere with business. But trading was unaffected and about 100 protesters were arrested. The Occupy Wall Street movement criticizes an economic system members view as favoring the rich and powerful. It has chosen Wall Street as a symbol of corporate greed.